Tt eSPORTS introduces the Level 10M Hybrid Mouse, a hybrid wired and wireless edition of the Level 10 M. The gaming peripheral will start shipping within a couple of days for $99.99. The Level 10 design concept originated back in 2008 when Thermaltake Group initiated the first design collaboration with BMW DesignworksUSA, and the design concept was widely and continuously praised for its futuristic design, open-space architectural structure, excellent heat dissipation properties, and its intuitive functionality. After the success of the Level 10 Chassis, Thermaltake and BMW DesignworksUSA decided to continue their pursuit in challenging themselves to create the most beautiful and functional products around in the realm of gaming peripherals with Thermaltake’s subsidiary brand Tt eSPORTS, via the Level 10 M series. The first product in the Level 10 M series, the Level 10 M Mouse continued the iconic design of the Level 10 Project with the same use of aluminum throughout, open-spaced architectural inspirations, and excellent ventilation properties. The M Mouse has garnered numerous design awards already. It was only natural for Tt eSPORTS and BMW DesignworksUSA to further continue their pursuit for highly aesthetic and functionally designed peripherals, which led to the recent 10 M Headset and now… The Level 10 M Hybrid Mouse! The Level 10 M Hybrid Mouse is the newest member of the Level 10 M family. 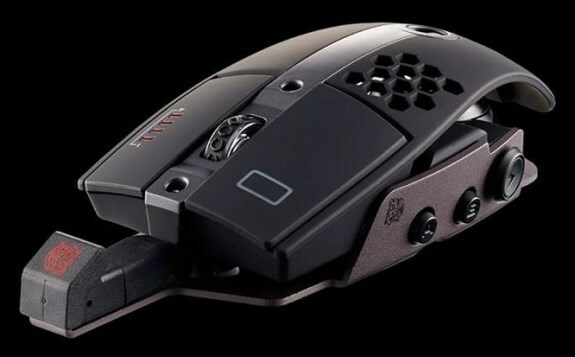 The M Hybrid Mouse is a hybrid wired and wireless mouse. It inherits the special characteristics of peripherals found in the Level 10 M series and of course it’s close sibling the M Mouse. The same use of the aluminum base to give the mouse a solid feel yet maintain good weight, innovative legacy 3D-steering axis movement which lets users adjust the height and angle at which the back cover comes into contact with their hand, and air-through ventilation system to keep hands cool are preserved. The M Hybrid Mouse takes what was an otherwise perfect mouse and makes it even better! The M Hybrid Mouse’s most obvious new update is that it is a hybrid wired & wireless mouse which functions both wired and wirelessly via 5.8G technology. 5.8G was chosen as 2.4G has become quite common in consumer products, and is thereby more prone to interference on those signal bands. But with 5.8G, the spectrum of signals available is much broader and able to avoid interference. The M Hybrid Mouse furthers the dichotomy the beauty in both asymmetry and symmetry hinted at in the aesthetic of the M Mouse; This time by adding considerably more heft in the grip on the right side of the mouse, in addition to leaner angles at the back of the mouse as it curtails in. The new aggressive styling manages to raise the already great ergonomics of the M Mouse to a whole new experience in the M Hybrid Mouse, as the mouse feels even more natural in hand while lifting it up during mouse usage.